There is so much to be thankful for as a coach. I am truly grateful that my job isn't really work. 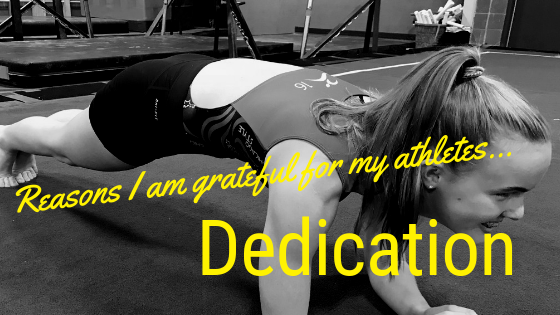 It is a chance to share what I love, learn from my athletes, and help them grow as individuals. There are many reasons I love coaching and the athletes on my Competitive Team are certainly the number one reason. Below are 7 reasons why I am grateful to coach them each day. I appreciate the dedication that my athletes show day in and day out. Gymnastics is not an easy sport. Everyday involves falling and getting back up. It requires repeating skills and drills not just until you have done them correctly, but until they become habit. This requires commitment, coming to each practice, being on time and ready to work. It sometimes requires missing out on a different opportunity and I have athletes who make that choice. 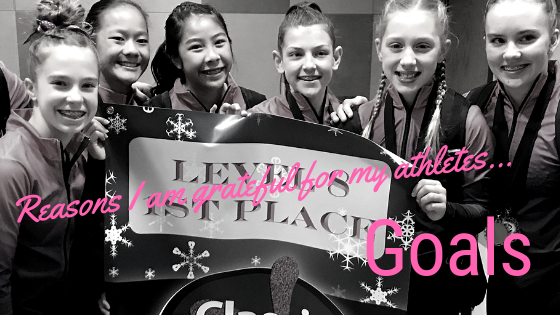 They are dedicated to being the best gymnast they can be and for that I am grateful! 2. They are role models. If you are looking for someone for your young daughter to look up to I can name a dozen. I am fortunate to work with young ladies everyday who most parents would love to have their daughter imitate. These ladies exemplify hard work, perseverance, and growth mindset. They are generous, supportive, and encouraging among many other great traits. This goes beyond the gym and into the classroom. They know how to lead by example and balance the challenges of school, life, and gym. They are role models to many younger gymnasts and for that I am grateful! When asking for help, I rarely get turned down by the girls that I coach. I have asked them to do a variety of jobs. Of course, there is the daily help of mat moving and helping a friend who is injured or down, but it doesn't stop there. We have asked our athletes to volunteer their time at competitions and with gym projects. We have also asked them to help with community service and leading their young teammates at activities. They do not disappoint. They continue to help and for that I am grateful! 4. They are like family. Gymnasts spend a lot of time together between practice and competitions. Many move from one level to the next together over the years. They experience highs and lows, injuries and achievements all at each others side. They compete against each other and with each other. They understand each other better than anyone else. Teams become like family celebrating birthdays, lending a hand in times of need, and just being there for the good times and the bad and for that I am grateful! 5. They are gracious and kind. There is not a day that goes by that I am not thanked. I am told thank you when I offer a correction, end a rotation, or finish a practice. I hear thank you in any given workout more than I would guess many adults hear thank you in a day or maybe even a week. Gratitude is also expressed through actions. I am fortunate to receive many high 5s, smiles, and encouraging statements. My athletes are gracious and kind to me and their teammates and for that I am grateful! I believe that I learn more from my athletes than they do from me. They show me the importance of having fun, playing games, smiling, and laughing. They demonstrate falling down and getting back up (literally and figuratively). Most importantly they continue to teach me that what I do matters and for that I am grateful! 7. They help me reach my goals. One of the strangest parts about my coaching job is that many goals often depend on the athletes I work with. Some of my goals that were gymnastics specific throughout the years have been to coach a level 10, to teach a yurchenko full, to coach at Westerns and Nationals. It would have been impossible to reach any of those girls without fantastic athletes and for that I am grateful. For every athlete I coach, I know that at some point their competitive gymnastics career will come to an end and when it does I am certain that they will be successful in their next pursuit.